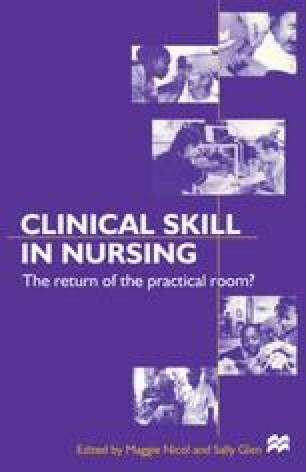 This chapter outlines an approach to the teaching and learning of clinical skills that forms an integral part of the overall clinical assessment strategy adopted in the BSc (Hons) Nursing pre-registration curriculum. Key values that have influenced the design and development of the clinical assessment strategy and tools are discussed, together with development work currently being undertaken in translating these into action. The search for a suitable model and strategy for teaching, learning and assessing nursing students in practice is briefly discussed, as is an outline of the model which is currently being tested. A key tool designed for formative assessment is the Portfolio, which includes a section for clinical skills learning. By adopting this approach, it is hoped that a balance between students ‘learning’ and ‘doing’ in practice can be achieved.